to publish his works at many newspapers and magazines. 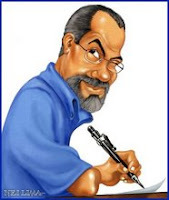 Actually he publishes his editorials cartoons, caricatures and in many Brazilian newspapers and magazines. His works of caricatures was awarded in many events Saloon of Humor. He had various exhibitions collectives in many Galleries of Rio de Janeiro - Brazil. Participated as a Jury member of the 19º National Saloon of Humor of Volta Redonda (Rio de Janeiro-Brazil). He teaches Cartoon and Caricatures since 2003 at University of Visual Arts (Rio de Janeiro-Brazil).